Death by Design: The True Story of the Glasgow Necropolis. 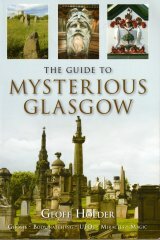 The first book published on Glasgow’s most famous graveyard, The Necropolis, for over 100 years, Ronnie Scott’s ‘Death By Design The True Story Of The Glasgow Necropolis,’ is destined, like its literary forebears, to become a classic on the subject. Following in the footsteps, and indeed the funeral cortège, of George Blair, whose ‘Biographic Descriptive Sketches of Glasgow Necropolis’ (1857) is the standard reference work for historians, Ronnie takes the reader on a fascinating tour of one of Glasgow’s greatest treasures and one of the finest ‘planned’ cemeteries in Europe; revealing the history of its development from public park to ‘dead res’ for Glasgow’s great and good, and its embellishment with an astonishing number of monuments designed and ornamented by many of Scotland and Glasgow’s most celebrated architects and sculptors. 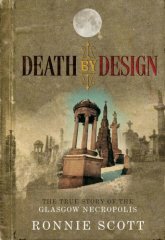 As well as being a Who's Who of its makers, Death By Design tells the story of those interred beneath the Necropolis’ magnificent monuments – a roll call of the rich merchants, eminent clerics, local politicians and poets, together with an army of military men, lawyers, artists, architects and their spouses and children, who populate the City of the Dead, and within whose 37 acres they ultimately met their own maker. Thanks to Ronnie’s enthusiasm for the subject and his witty prose, death has rarely been so much fun, or so fascinating in its detail. Illustrated by Pol Cavin, Death By Design is published in paperback as a pocket book (122 pages) and is available through this website at a price which is also easy on the pocket: The team at glasgowsculpture.com congratulate Ronnie on the publication of this little gem, and heartily recommend his Death By Design to our visitors. Published by Black And White Publishing. Publication date: 31st May, 2005.